Alongside Willie Mae Ford Smith, Sister Rosetta Tharpe is widely acclaimed among the greatest Sanctified gospel singers of her generation; a flamboyant performer whose music often flirted with the blues and swing, she was also one of the most controversial talents of her day, shocking purists with her leap into the secular market -- by playing nightclubs and theaters, she not only pushed spiritual music into the mainstream, but in the process also helped pioneer the rise of pop-gospel. Tharpe was born March 20, 1915 in Cotton Plant, AR; the daughter of Katie Bell Nubin, a traveling missionary and shouter in the classic gospel tradition known throughout the circuit as "Mother Bell," she was a prodigy, mastering the guitar by the age of six. At the same time, she attended Holiness conventions alongside her mother, performing renditions of songs including "The Day Is Past and Gone" and "I Looked Down the Line." In time, the family relocated to Chicago, where Tharpe began honing her unique style; blessed with a resonant vibrato, both her vocal phrasing and guitar style drew heavy inspiration from the blues, and she further aligned herself with the secular world with a sense of showmanship and glamour unique among the gospel performers of her era. Signing to Decca in 1938, Tharpe became a virtual overnight sensation; her first records, among them Thomas A. Dorsey's "Rock Me" and "This Train," were smash hits, and quickly she was performing in the company of mainstream superstars including Cab Calloway and Benny Goodman. She led an almost schizophrenic existence, remaining in the good graces of her core audience by recording material like "Precious Lord," "Beams of Heaven," and "End of My Journey" while also appealing to her growing white audience by performing rearranged, uptempo spirituals including "Didn't It Rain" and "Down by the Riverside." During World War II, Tharpe was so popular that she was one of only two black gospel acts -- the Golden Gate Quartet being the other -- to record V-Discs for American soldiers overseas; she also toured the nation in the company of the Dixie Hummingbirds, among others. In 1944, she began recording with boogie-woogie pianist Sammy Price; their first collaboration, "Strange Things Happening Every Day," even cracked Billboard's race records Top Ten, a rare feat for a gospel act, and one which she repeated several more times during the course of her career. In 1946, she teamed with the Newark-based Sanctified shouter Madame Marie Knight, whose simple, unaffected vocals made her the perfect counterpoint for Tharpe's theatrics; the duo's first single, "Up Above My Head," was a huge hit, and over the next few years they played to tremendous crowds across the church circuit. 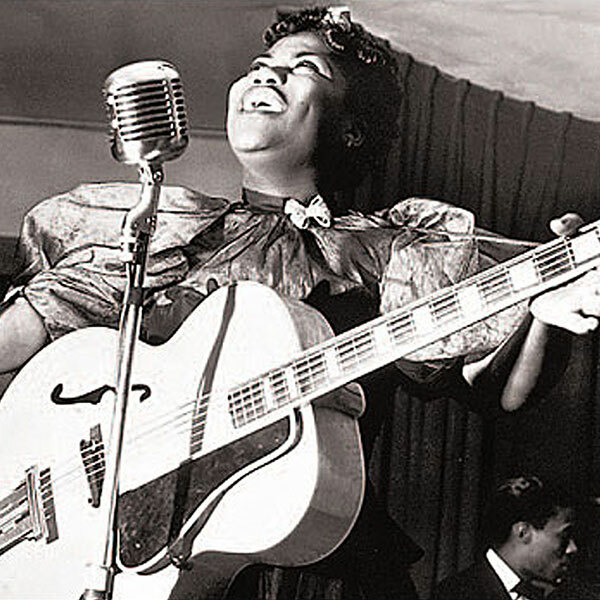 However, in the early '50s Tharpe and Knight cut a handful of straight blues sides; their fans were outraged, and although Knight soon made a permanent leap into secular music -- to little success -- Tharpe remained first and foremost a gospel artist, although her credibility and popularity were seriously damaged. Not only did her record sales drop off and her live engagements become fewer and farther between, but many purists took Tharpe's foray into the mainstream as a personal affront; the situation did not improve, and she spent over a year touring clubs in Europe, waiting for the controversy to die down. Tharpe's comeback was slow but steady, and by 1960 she had returned far enough into the audience's good graces to appear at the Apollo Theatre alongside the Caravans and James Cleveland. While not a household name like before, she continued touring even after suffering a major stroke in 1970, dying in Philadelphia on October 9, 1973.